Well, I’m a bit overwhelmed with other projects in real life right now and the recipe I wanted to make for you guys is not really going well. It needs at least two more attempts before I get it to a place that’s blog worthy. But fear not, there will be a post. Regular readers and my friends in real life are aware of my spice addiction. My collection has 186 entries on my google docs inventory spreadsheet and is housed by a bookshelf, a spice cabinet that’s 12″x12″x48″, and half an armoire style cabinet. One of the problems I encountered when the corn allergy hit was that many of my spice blends were no longer safe due to anti-caking agents and actual ingredients (citric acid) on the label, or that many of them I didn’t tolerate well anymore due to cross contamination issues. I do very well with Penzey’s or Frontier single spices, but blends can be an issue. So I recreate my favorite blends. You may remember a prior post I did on spices DIY Spice Mix Day – Montreal Steak, Creamy Peppercorn, Singapore, and Full of Flavor Herb Mix. Since I thought it might be helpful for other people, I decided to share three more of my mixtures that I use constantly. Greek seasoning is something I use almost daily. I put it in vinaigrette salad dressings, I toss vegetables with it and some olive oil and roast them, and I use it on steamed vegetables with a bit of olive oil instead of butter (I have a dairy allergy and I only use my homemade margarine for special occasions as it’s a pain to make). I keep a shaker on the table at home and one at work for lunches there. I make a pint jar of this at a time, but this recipe is a little less than cup and it’s easy to cut in half if you just want to try it. Great for vegetables, salad dressings, and just as an every day seasoning in place of salt or pepper (although it has salt and pepper in it). Place all ingredients in a blender and blend until combined. Store in an airtight container. Enjoy! Prime Rib Seasoning is a blend that I use primarily for beef roasts. It’s unbelievable as a rub on prime rib roasts or other beef oven roasts, great to season stew beef before searing it and to season the beef stew itself, and I also use it to season pot roasts before searing and braising in the oven. Seasoning to use on prime rib and other beef roasts, beef stew, and pot roasts. (The blend itself is vegan, it's the use that isn't, but I bet it'd be great in a root vegetable stew). 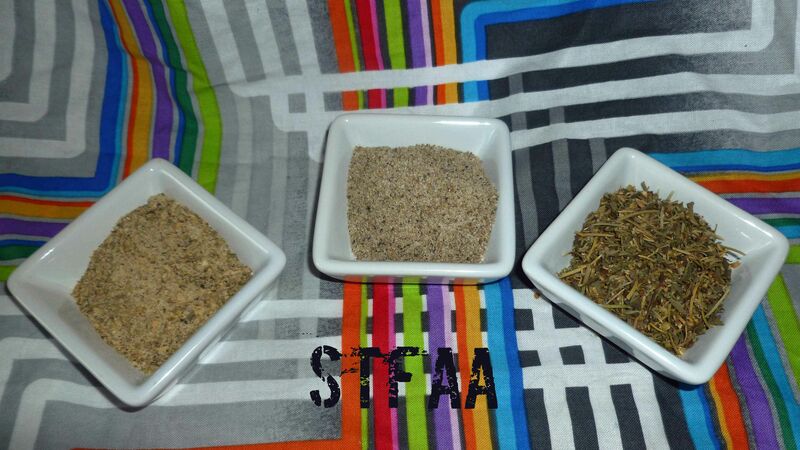 Place all ingredients in a blender and blend until celery seed is ground. Store in airtight container. Enjoy! Italian Seasoning is a blend that was always in your spice cabinet if you grew up where I did. It got added to all manner of crock pot creations, soups, stews, and tomato sauces. It was an easy way of adding basic seasonings, such as oregano, basil, thyme, rosemary, marjoram and sage, without actually having to buy all those seasonings. Since my husband does a lot of crock pot recipes, and since I still use Italian seasoning as a crutch at times, even though I have all that stuff in my spice cabinet, and since I’m concerning about cross contamination in blends, I mix up my own now. This recipe makes about a cup, but we make a quart at a time because we do fly through it pretty quickly. A quart might last us three months. Put all ingredients in a bowl and mix until thoroughly combined. Store in an air tight container. Voila! Go out and season your food! Let us know if there are blends you are missing that you’d like us to try to create/recreate for you.